Get a Copy of Ajax Search Pro! Show exact matches only (default: Off) - if enabled, the search will return only exactly matching phrases. This feature is not available if the index table engine. 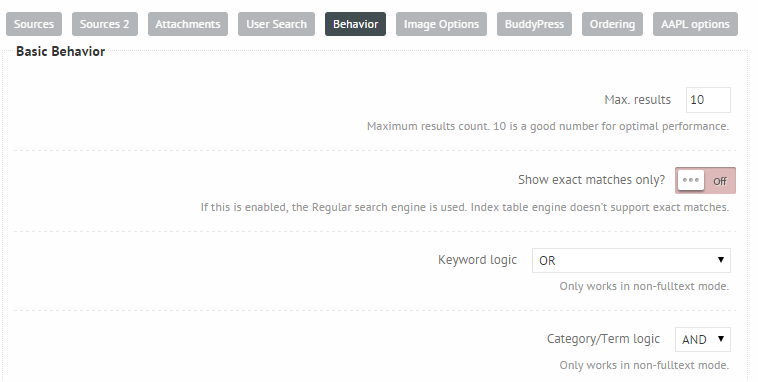 Keyword logic (default: OR) - defines the logical operator used between multiple search phrases. More info in the keyword logic section of this documentation. Category/Term logic (default: AND) - defines the logical operator between available terms per taxonomy of a post. AND - displays the result only if each of the terms (for example categories) match. If any of the categories matching the post is excluded or unchecked on the front-end, the result is not displayed. OR - displays the result if at least one of the terms (for example categories) match. If at least one category is not excluded where the post belongs, it will be displayed.